Last week, C2ES released a report titled Climate Change & International Security: The Arctic as a Bellwether. The report highlights the role that climate change in the Arctic plays in shaping the geopolitics of the post-Cold War world. The authors note that climatic shifts and subsequent shifts in the geopolitics of the Arctic demonstrate the importance of the linkages between climate change, energy security and economic stability. Melting sea ice cover has opened up the Northwest Passage and expanded shipping routes as well as hopes for increased access to oil and gas exploration, fishing and tourism opportunities. Countries with shorelines bordering the Arctic or with interests in access to these resources have not failed to notice the opening of new opportunities and are positioning themselves militarily, politically and economically to respond to these climatic and geopolitical shifts. Since 2008, Canada, Denmark, Norway, Russia, the United States, the European Union, the Nordic countries and NATO have all made major Arctic policy announcements. So many policy announcements from major players in such a short time frame is highly unusual—not just for the Arctic but for international affairs in general. A prevalent theme in nearly all the policy announcements was the need to protect the region’s environment in the face of rapid climate change and increased economic activity. In most statements, the states have emphasized their commitment to cooperation and to the principles of international law. As one example, the five coastal Arctic states—Canada, Denmark, Norway, Russia and the United States—agreed in the 2008 Ilulissat Declaration to settle any territorial disputes in the Arctic under the principles of the law of the sea. On the other hand, many of the Arctic states’ actions and statements make it clear that they intend to develop the military capacity to act unilaterally, if necessary, to protect their national interests in the region. Most of the Arctic states are modernizing their military forces in the Arctic. For example, the United States recently began operating its newest class of fast attack submarines in the Arctic and the Russians have begun building a new fleet of nuclear-powered submarines for both fast attack and ballistic missile launching missions. Norway announced plans to purchase 48 F-35 Joint Strike Fighters, and both Norway and Denmark have equipped their navies with Arctic combat capabilities. With countries rebuilding their Arctic military capabilities. If political cooperation in the region should sour, most will have forces that are prepared to compete in a hostile environment. 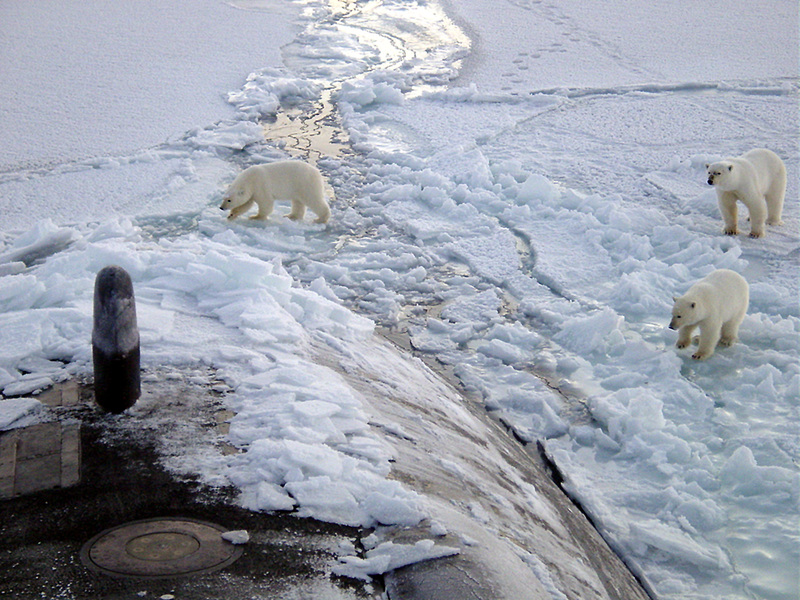 Non-Arctic states and organizations have also begun to consider Arctic security as well. Of special relevance, NATO has begun to coordinate with its Arctic members on search and rescue. Since Russia views NATO with suspicion, the alliance’s role in the Arctic has the potential to create tensions. The principal cause of renewed national interest in the Arctic is the increasing accessibility of Arctic waters. However, interests in the region vary somewhat from country to country. As new sea routes open up, Canada and Russia see their core interests as maintaining sovereignty in their territorial waters, while the United States puts greater emphasis on freedom of the seas for navigation. Russia, meanwhile, has invested tens of billions of dollars in Arctic oil projects, and its recent statements and actions suggest that it will act to safeguard its oil wealth in the region. The importance of Arctic oil will grow for all nations as oil prices continue to rise and the desire for energy security grows. The widely held notion that climate change will occur gradually over the 21st century, allowing ample time for society to adapt, is belied by the unprecedented pace of both climate change and policy developments in the Arctic today. Such rapid changes will challenge governments’ abilities to anticipate and diplomatically resolve international disputes within the region. If the Arctic is a bellwether for how climate change may reshape global geopolitics in the post-Cold War era, then other countries should watch closely to learn from our successes or failures in managing this new breed of security challenge in the North. By Francesco Femia & Caitlin Werrell in climate and security on May 11, 2012 .